Ears twitched. Deer flies hovered over a hat-sized patch of mud, dried on a muscled shoulder. A long, black, broom-like tail swished twice, almost reaching the closest steer’s back, the largest one, an Angus/Limousin cross. 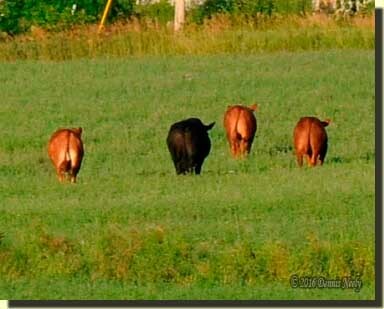 Three cinnamon-red Herford/Limousin-cross cattle stood just beyond the ringleader. One of the “reds” raised then thrust down a cloven hoof. A small dust cloud marked the spot. Three Sandhill cranes chortled to the southwest, around the bend in the wagon trail and up on the first hill in the tilled field. A dozen minutes before, that trio stood erect with their slender beaks following the plodding progress as three gray-haired backcountry boys urged the four head along. The prairie grass beside the bean field smelled of dew, burning off in the brilliant sunlight of a humid July morn. The lower field’s headlands, where the four now rested, showed nary a wisp of greening sprouts, thanks to a late spring drought. There the air was parched, dry and dusty. The only hope of a potential crop was rocks and gravel. Why the cattle decided to stop there defied reason, but cows don’t reason well, do they? Walt, the farmer who owned the wayward steers, shook a bucket half-filled with shelled corn. The southern-most steer turned and looked at him. It raised its head and appeared ready to start walking again, but the Angus, the one we started calling “That Black Devil,” wouldn’t budge. He faced south, content to just stand and switch his tail and chew and drool. Not knowing these four, fifteen paces was as close as I dared venture. We all spoke soft, urging then to again strike off on the journey home, but they were not ready to move, at least the Black Devil wasn’t. Patience is a virtue when herding cattle. A steady plodding beats a fast walk, or worse yet, an outright run. Anyway, as I walked behind the steers, I found myself humming the theme song to that show. I used to do that when I was a kid and helped wrangle the dairy cows. I suppose that is a version of time traveling. I looked up the show and discovered it ran from 1959 to 1965. The scary part is when you stop to do the math and realize that was a half-century ago. Some days living history/time travel has a more frightening side to it. When we had our little “standoff” in the bean field, I felt myself slipping farther back than just a half century. Before those few minutes, I tried real hard to picture the four head of cattle in an 18th-century setting. Not being dressed in period-correct clothes and not having “Old Turkey Feathers,” my Northwest trade gun, in my hand didn’t help the situation any. I should have known better. 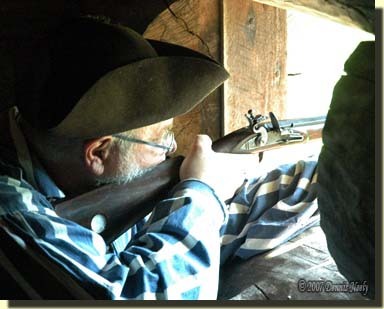 A traditional black powder hunter can’t force his or her way back into yesteryear’s cobwebs. I stared into the eyes of the Angus. He stared back and drooled a bit. In hindsight, at that moment I felt myself drifting, physically moving, or so it seemed. Perhaps it was the heat, but I couldn’t perceive either Jerry or Walt, only those steers before me. I glanced to the south, then to the north. I turned to my right and checked my back trail. “This is how Jonathan Alder became a captive,” I whispered. The mystique of those few fleeting pristine moments evaporated when the steers left the wagon trail and turned north on the gravel road that led back to the Wright homestead and barnyard. But as so often happens, my mind mulled over those pristine moments, especially my looking about, in the context of the 1790ish frontier. As living historians and traditional hunters, we spend countless hours sifting through primary documentation in search a tiny golden nugget, yet we often fail to recognize the gold dust that exists in our own life experiences. As I thought about Jonathan Alder chasing the mare and colt, I realized I have a modest amount of background tending farm animals, and further, farming in general. That knowledge never makes its way into my traditional hunting/living history scenarios, and it should. Give traditional black powder hunting a try, be safe and may God bless you. 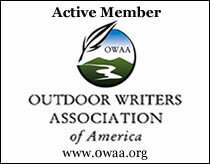 This entry was posted in Persona, Worth thinking about... and tagged Black powder hunting, Dennis Neely, historical trekking, Mountain Man, Native captive, North West trade gun, Northwest trade gun, trade gun, traditional black powder, traditional black powder hunting, traditional blackpowder, traditional blackpowder hunting, Traditional Woodsman. Bookmark the permalink. Michigan State Muzzle Loading Assoc. © 2011 Dennis Neely & Wild Rivertree. All rights reserved. Please attribute all quotes and obtain permission to reproduce articles, images or illustrations.